FREE SHIPPING ON ORDERS OF $295 OR MORE! PLEASE EMAIL US FOR A SHIPPING QUOTE. 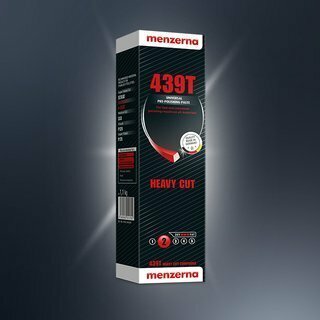 MENZERNA STANDS ALONE AS THE POLISHING MATERIALS LEADER IN THE AUTOMOTIVE INDUSTRY. MENZERNA IS A GERMAN-BASED COMPANY THAT HAS BEEN MANUFACTURING POLISHING MATERIALS FOR OVER A CENTURY. WHEN IT COMES TO CLEAR COAT REPAIR, MENZERNA COMPOUNDS ARE PREFERRED BY PROFESSIONALS FOR THEIR QUALITY AND WORKABILITY. IF YOU WANT A CLEARCOAT REPAIR SYSTEM THAT SETS THE STANDARD FOR THE AUTO INDUSTRY, THIS IS IT. MENZERNA COMPOUNDS CONTAIN NO SILICONE OR FILLERS, AND ARE PAINT SAFE. For single items and sets, click on the left below. For case quantities, click on the right. INTERNATIONAL CUSTOMERS, PLEASE EMAIL US FOR A SHIPPING QUOTE. FREE SHIPPING ON ORDERS OF $295 OR MORE! INTERNATIONAL CUSTOMERS, PLEASE EMAIL US FOR A SHIPPING QUOTE. MENZERNA STANDS ALONE AS THE POLISHING MATERIALS LEADER IN THE AUTOMOTIVE INDUSTRY. MENZERNA IS A GERMAN-BASED COMPANY THAT HAS BEEN MANUFACTURING POLISHING MATERIALS FOR OVER A CENTURY. WHEN IT COMES TO CLEAR COAT REPAIR, THEIR COMPOUNDS ARE PREFERRED BY PROFESSIONALS FOR THEIR QUALITY AND WORKABILITY. IF YOU WANT A CLEARCOAT REPAIR SYSTEM THAT SETS THE STANDARD FOR THE AUTO INDUSTRY, THIS IS IT. MENZERNA COMPOUNDS CONTAIN NO SILICONE OR FILLERS, AND ARE PAINT SAFE.